Artemisia is a large genus of plants, with between 250 and 500 species. Most of them grow in temperate zones on the northern hemisphere. The genus belons to the family Asteraceae. 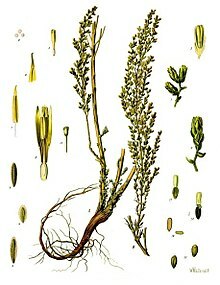 Example species in aremisia are mugwort (A. vulgaris), Wormwood, or Sagebrush. ↑ "Genus: Artemisia L." Germplasm Resources Information Network. United States Department of Agriculture. 2007-04-13. Retrieved 2011-02-14. This page was last changed on 15 March 2013, at 19:26.